Now, back to the purpose of this blog series. I wanted to review several of the adventures from a design perspective, sharing some insight into how the adventure was created, highlighting areas where we tried new things, and sharing what we learned in going from concept to draft to actual play. Note: As with all parts of this blog series, there are spoilers within! Chad Brown, Chris Sims, Matt James, and I were the original admin team. Along with Baldman Games chief Dave Christ, we began to work on the campaign’s identity. An early breakthrough came as we discussed the potential that players would see this campaign as ‘every player for her or himself’ and seek opportunities for disruptive play (player vs player, “I’m a templar and will turn you in”, etc.). We even considered factions for a while. But, we knew this campaign was designed as a small focused story-rich experience in amongst other organized play options. We wanted the players to stay focused on the story and their role in it as a team. That’s when Chris Sims suggested the Veiled Alliance. While I like the VA as a campaign option, it isn’t my favorite. The VA’s secrecy and cell structure can result in the adventures being a series of disjointed missions. The PCs are in the dark, but not in a fun way. Still, having the PCs work for the ‘arguably good guys’ had a nice team feel to it. The fighting in the streets was a bit like this. We wrote adventures as Chapters. Each chapter would have a strong thematic feel and constitute a major part of the plot of the overall campaign. As we worked together on the outline for the chapter we hit upon the idea of the PCs starting by having their world turned upside down. If the Tyrian VA was taken down, the story would really focus on the PCs. The PCs would be up against great odds but with the potential to establish the future of the VA. This really helped convince me that having PCs be part of the VA was a great idea. I think I proposed the first outline for the events of the three adventures, based off of the many ideas everyone had contributed. In my outline the PCs met with a VA contact on a street corner, revealing that the VA was being subjected to a series of attacks by an unknown group. The PCs would slowly realize how big a threat this was. Chris Sims again stepped forth. He pointed out that we had an opportunity to really rock the players’ expectations. Instead of some street corner, the PCs were in the VA’s most important secret lair. The attack would take place there, in their home. Everything they had taken for granted would be gone, including their favorite teachers. That idea really started the campaign off on a great foot. Ideas coalesced as Chad took control, writing in an encounter with a foe that the PCs could not overcome (later revealed as Obadias, the leader of a nemesis organization known as The True). It included the PCs’ cell leader, Sartaj, being imprisoned and hauled away on a slave caravan. The PCs, some of whom might be former slaves, probably had to become slaves to have a chance to free her. In most cases, the PCs would be stripped of all their gear and perhaps be beaten up by caravan guards in an impromptu arena. Destitute, at the end of the adventure they arrive at the town of Altaruk, hoping they have escaped trouble. In retrospect, it was a great start. A big part of that was a breakthrough idea one of us had, reinforced by a strong hand by the author and the contributions of all of us. That way of working would be a big key throughout the campaign. The very first encounter also showed our emphasis on creating options for players and DMs. After the PCs fight their way out of their room they find themselves in the maze of corridors that is the VA safehouse. Attackers are all over the place. We encouraged DMs to decide exactly how the PCs escape. They might face waves of attackers, might encounter a variant skill challenge made up of scenes (some ideas were provided), etc. 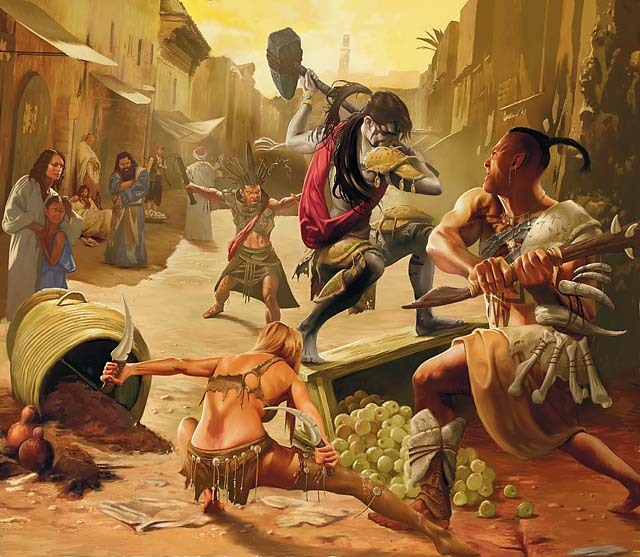 From the very beginning we wanted to step away from the highly scripted and prescribed nature of most 4E adventures. 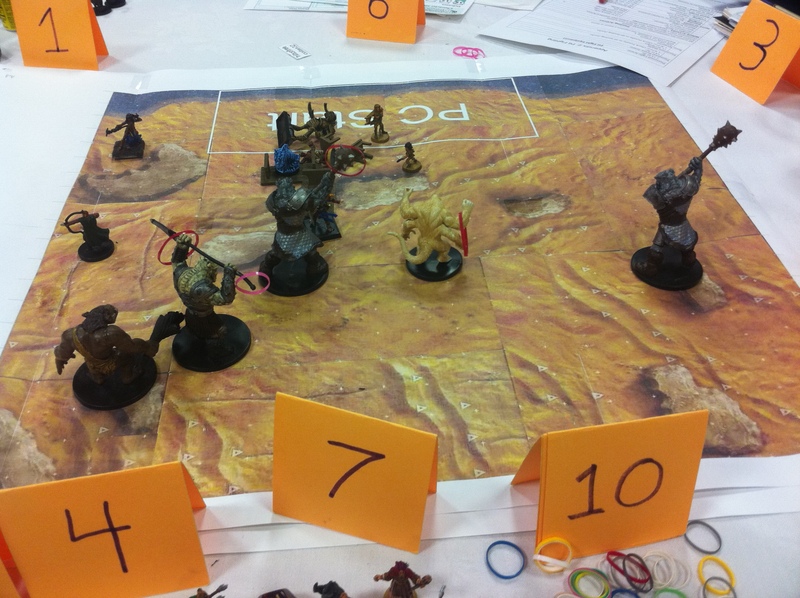 We saw the results immediately at conventions – tables tended to do entirely different things here and the DMs came up with all kinds of interesting scenes. Some times ran combat mapless, in our very first adventure! usually authors are exhausted and the admin finishes the work. For the first Chapter we did the authoring ourselves. In AOA1-1 we wanted players to be faced with getting onto a slave caravan – something very much against their nature. I think early drafts had this as a skill challenge, but eventually it became role-playing. The DM would provide some information on how Sartaj was on this slave caravan that would soon leave Tyr, and how it was best not to attack it now but rather somehow get onto it. The PCs would find a way onto it. It was also a problematic design approach. We had written the encounter as a sort of ‘unlock’ of the right thing, rather than encouraging DMs and players to create a story together. Keep in mind that all of this is volunteer work. It won’t shock organized play veterans to hear that adventures are often finished at 2 AM three days after we wanted them to reach the hands of convention DMs! Timelines are tough when family, work, and other demands spring up (they always do). Hearing these issues encouraged us to became the first organized play campaign to edit each adventure a second time after the first convention. Each chapter ran at two conventions, so this let us deliver higher quality for the next convention. It also faced us to own our prior mistakes rather than forget them. It was an extra amount of work, but we really liked the benefits. What we did for this encounter was to flip it around from what won’t work to a list of what PCs would likely try and how it could eventually work. We also offered guidance on the approach in general, to encourage DMs to handle out-of-the-box thinking positively/creatively. Sneaking onto the slave caravan is hard, but it counts as legwork and provides clues that lead them towards other options. If they try hard enough, they can still sneak. This transformed the experience! Now the DM knew they should work with the PCs in response to their actions. Together they created their own story of how they ended up on the slave caravan. The best part of this is that it uniquely altered the next encounter, where the PCs worked to rescue Sartaj and themselves from the caravan. Players ended up owning their story and the DM was facilitating it. Time to go! Fighting huge B’rohg as they try to escape the slave caravan. Give PCs a common goal: D&D experiences are usually best when PCs have a common heartfelt goal. Nothing cements that like a common adversity – right from the start of the adventure. For Ashes of Athas, a big exciting start helped create a compelling story players wanted to keep on playing. Share design: In writing for organized play, a group design approach can really pay off. It takes good people and checking the majority of our egos at the door. Keys to working together include being open to ideas and having in mind the overall goal (we all want an awesome campaign and for being an admin to be fun). Throughout the campaign we had situations were ideas came out of left field and transformed the adventures or even the campaign. Learn from mistakes and revise; Show DMs positive examples, not negative: 4E is great for open imaginative play. It starts with the story and selecting the mechanics and writing style that will help DM and players create the right play outcome. At times it was hard to do this, so we tried to learn from our failures. Choosing to edit our adventures after premieres helped us learn from our mistakes. One of the early lessons was to write about how the players could do what they wanted, rather than state things that would not work. Next time we look at an adventure that would throw us off our goals for an entire chapter! 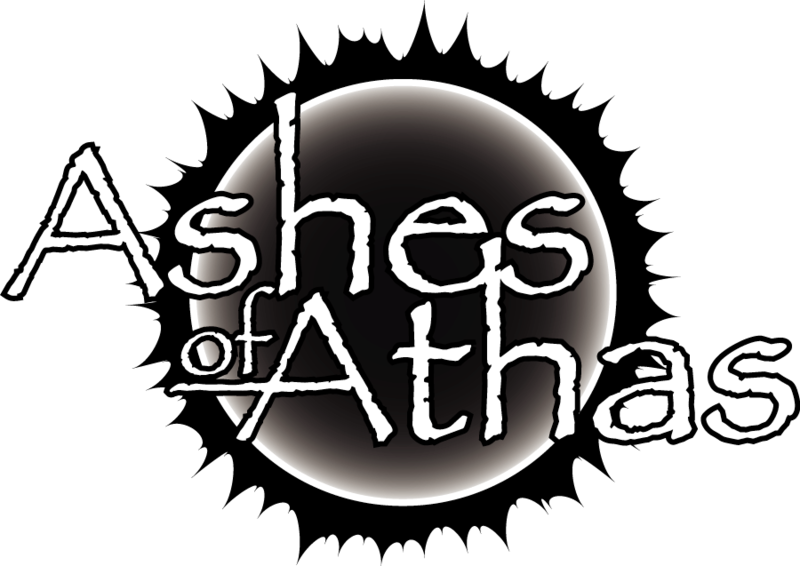 This entry was posted on October 20, 2015 by Alphastream and tagged 4E, Ashes of Athas, Authoring, Mapless Combat, Setting, World-building.